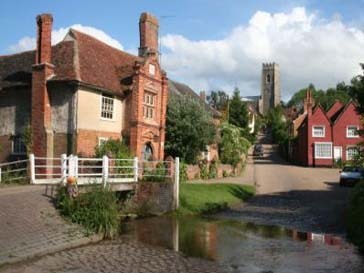 With a population of around 350, the parish of Kersey consists of Kersey village and four hamlets: Kersey Tye, Kersey Upland, Wickerstreet Green and William’s Green. The village of Kersey, straddling a ford and up the slopes of a little valley with its church crowning the hill on the south side, is regarded as one of the most picturesque villages in East Anglia. While it possesses an important collection of medieval buildings, Kersey is also a vibrant community centred on its school, church, village hall and local pub. Located between Ipswich, Sudbury and Lavenham, Kersey is situated amidst rolling Suffolk countryside. It is good walking country and the church, dating from the 12th century and pub are well worth a visit.